Please click here to find out about christenings, weddings, and funerals. Quiet Communion A quieter, reflective service with a sermon. 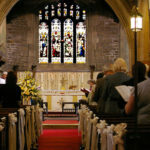 A less formal service for all ages with a sermon and a mix of traditional and modern hymns, songs, and Communion music. Once a month, usually on the 1st Sunday, we have Word Alive, a service without Holy Communion. Some months this involves our schools. There are “church bags” for younger children, to help them feel involved, and a crèche for when they need a break. Children and young people are welcome any Sunday. Quiet Communion Similar to Sunday, but with coffee afterwards. Every 2-3 weeks (in term time) a class from one of our schools attends and we use a simplified service. 20-minute services including Psalms, Bible Readings and Prayers; please check the weekly notice sheet for changes. We arrange evening services (normally at 6pm) in various styles about once a month and to mark key Christian festivals. This includes services of Evening Prayer and Holy Communion using the traditional Book of Common Prayer. We also join with the other churches in Great Harwood for special services arranged by Churches Together. Transport to Church We are delighted to arrange transport for those unable to reach church unaided. Please contact the Parish Office.